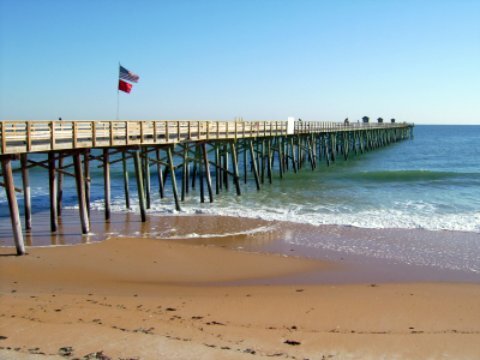 Flagler Beach Florida: A great beach vacation destination for a beautiful beach, sport fishing off the pier and the thrill of walking all the way to the end of the fishing pier. Walk the 804’ pierand enjoy incredible ocean breezes while you’re entertained by a variety of sea life (dolphins and huge fish) that couldn’t, or wouldn’t, come close to shore. Pssst: Don't forget to bring fishing gear if you are so inclined and catch your dinner. Or, catch a sailfish and feed everyone on the pier. Flagler owners of small stores and the local residents take great pride in their ‘old-fashioned’ community and work hard to keep it that way. After all, this is the town that didn’t let Starbucks in! Furthermore, the zoning doesn’t allow new buildings to be more than three stories tall. Without the big chain hotels, the little town of Flagler could be easily missed as you drive along Florida A1A but instead, circle it on your map and put on the brakes when you get here. Explore a little, meet the Flagler Florida store owners and pretty soon, you will be on a first name basis with the local townsfolk. Flagler Beach Florida loves visitors so come enjoy the warmth of the people AND the sunshine along with the cooling effects of the ocean breeze (and some homemade coffee, of course). The waves are strong enough for some great surfing or if you just need to decompress, this is a perfect choice for a lazy day at the beach with a good book and some intermittent naps. If you love antiquing, check out Evia’s by the Sea Antique Shop for some lovely, classic pieces of furniture. For those who enjoy history, a visit to Bulow Plantation Ruins Historic State Park to see the sugar mill ruins there. For a very laid-back night club, check out Mother’s and show off your singing ability with some karaoke (or until you are told to get off the stage). Mother's is located right across the street from the beach too, giving you an awesome nighttime view. Kids of most ages: Bring the kids to Flagler Beach Florida and let them ride the waves on boogie boards. It’s a lot of fun so get an extra boogie board or two and join in the fun! Eating: For fresh, affordable seafood in a beach setting, try Flagler Fish Co. Or, try a place where celebrities go because the food is so good- High Tides at Snack Jack, which is located right on the beach and has some great ahi tuna tacos and more. Sleeping: The innkeepers at Island Cottage Oceanfront Inn, Café & Spa make this a delightful Bed and Breakfast retreat. For something a bit more affordable, but also cozy and right on the beach, stay in the Whale Watch Motel. Come on down to Flagler Beach Florida and see why it's called 'The Jewel of the East Coast'!